Having a new baby (the most beautiful baby in the world, btw), I think I literally take around 20 photos a day. I'm obsessed with documenting everything she does...every pose, every smile, every cry. I mean really, how could I not be obsessed with pictures of my beautiful girl?!! The trick was trying to find a way to display all of these photos. I knew I wanted a gallery wall, I knew I wanted a random mix of frames and I knew I wanted to be able to quickly change out my photos. 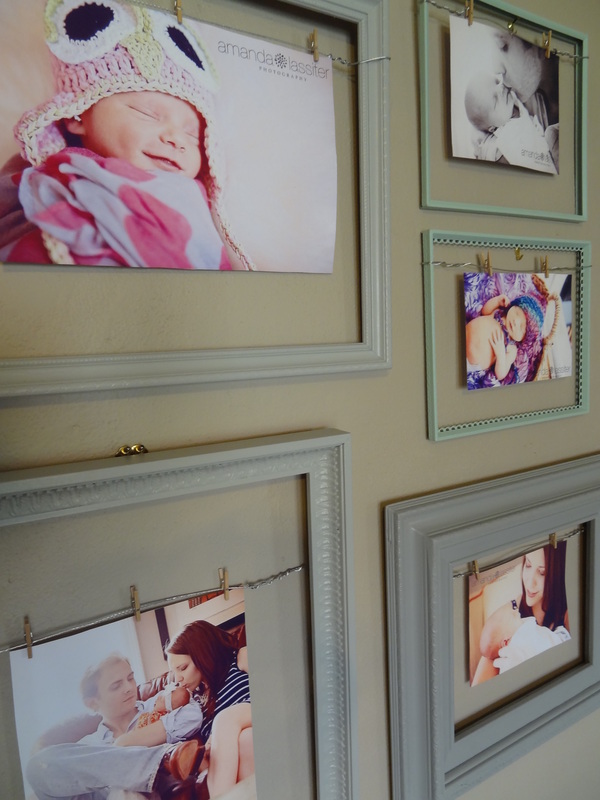 After a lot of thought and Pinterest surfing, I had a plan...I was going to wrap wire around random frames and hang the pictures with mini-clothes pins! 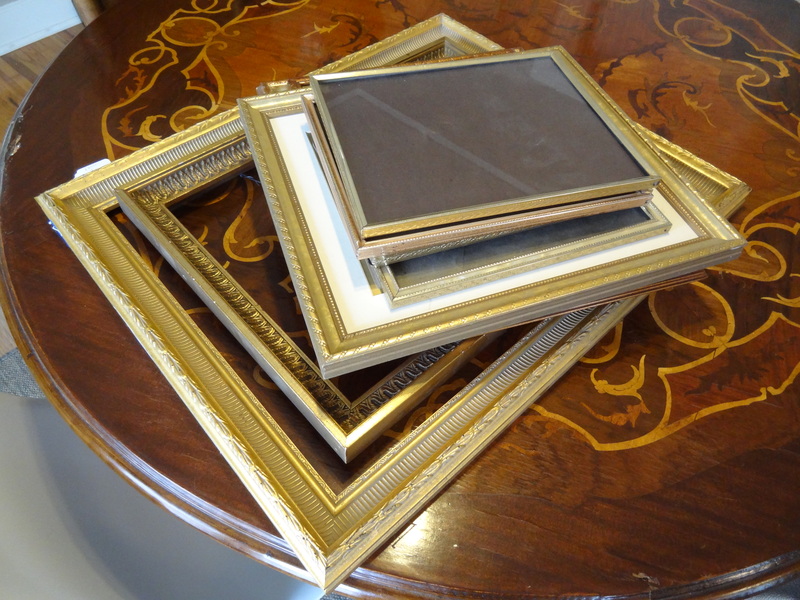 I started off with some ugly gold frames I picked up at a local thrift store for a few bucks each. As far as paint, I went to Lowes and chose two shades of grey and one shade of mint green. Painting the frames took longer than I thought. It was easy, but there were so many nooks and crannies I had to get into. 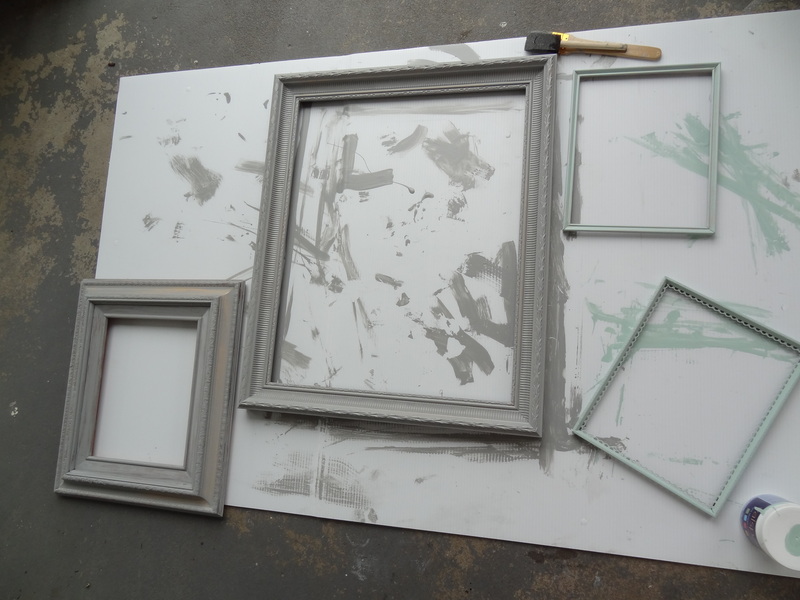 Once the frames were painted, I wrapped them tight with picture frame wire. 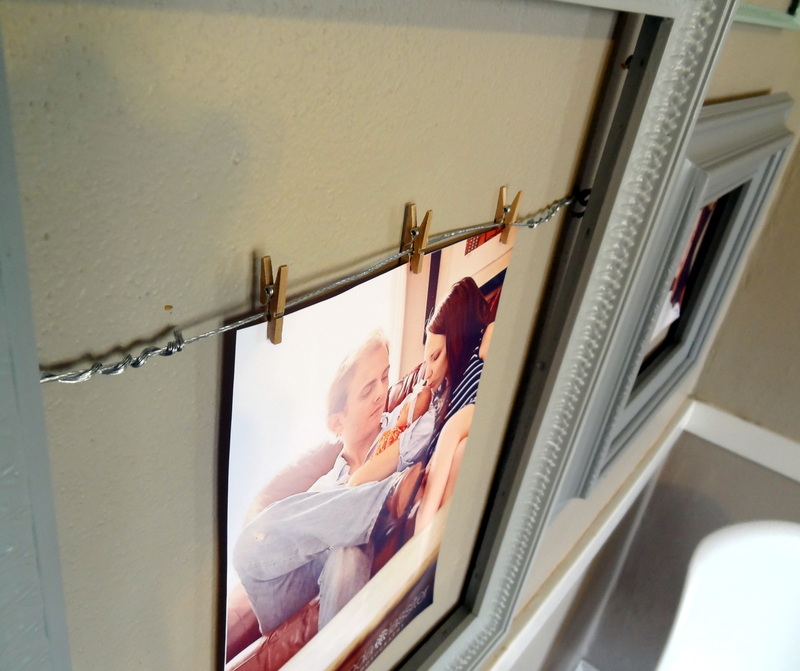 On some of the frames, I looped the wire around the edges and on others, I attached the wire to the back of the frame. I think it turned out great! This was such a simple project and I love being able to swap out my photos on a whim. 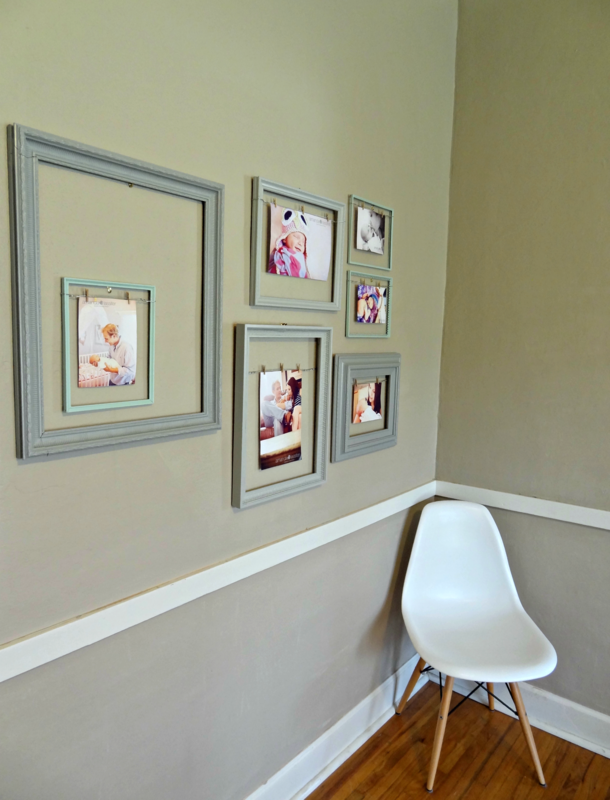 This is definitely a great alternative to a traditional gallery wall. That is adorable! I may do that as well! Thank you so much! I'm glad you like the frames! They are so easy to do! Do it! You'll love them! Hi there, Just found your blog! I too just had a little girl (July 31st) and I am obsessed with taking pictures of her. 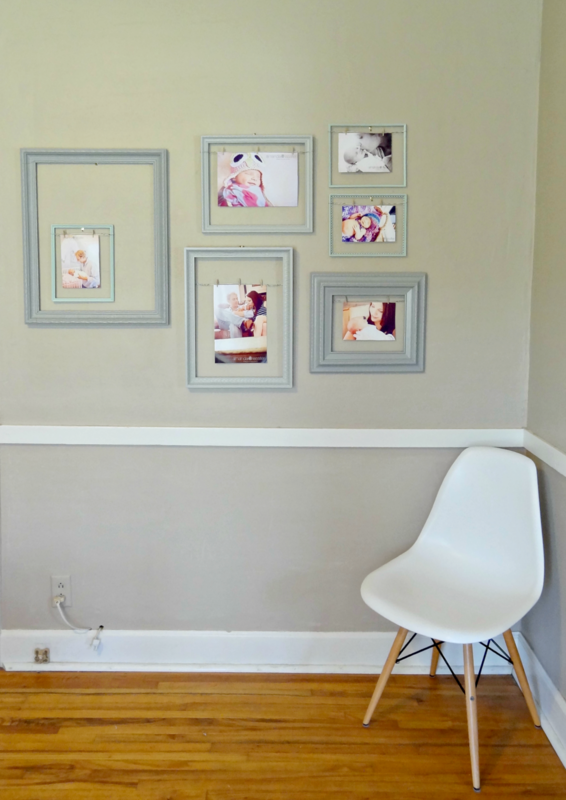 I love this frame wall, it just might be my next project for her room. Anyways your family is adorable and I enjoy your blog! Thanks Tiffany! How can you not be obsessed with baby pictures?! I swear, little girls are the absolute best!